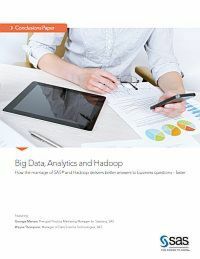 This paper shows how the marriage of SAS and Hadoop delivers better answers to business questions - faster. to make sense of it all. SAS and Hadoop are natural complements. SAS treats Hadoop as just another data source and technology that can be brought to bear for appropriate use cases. SAS brings world-class analytics to the merits of Hadoop.